U.S. coal-fired power plant closures will set a record this year, according to the Institute for Energy Economics and Financial Analysis. 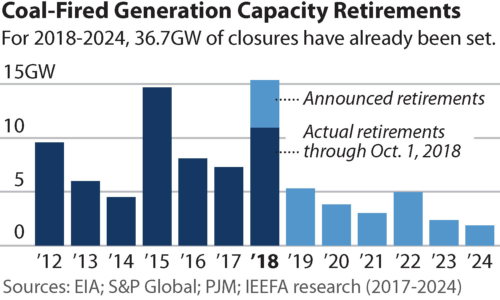 The group found that 2018 retirements are expected to total 15.4 gigawatts of power. In all 44 units at 22 plants in more than a dozen states will close up shop. In the next six years, an additional 21.4GW of coal-fired capacity is expected to go offline. States closing coal plants include Florida, Indiana, Kansas, Kentucky, Maryland, Minnesota, Missouri, Ohio, Pennsylvania, Tennessee, Texas, Virginia, West Virginia and Wisconsin. What do you think about the closures? What do you see as the future of coal? Paul, put another way: “Natural Gas Consumption Increasing at Record Rates”. That’s because Americans consumed over 27 tcf of unnatural gas last year (for those unfamiliar with tcf, that’s trillion cubic feet, or 27,000,000,000,000 cf), up 13% from 2010. What do I think about coal closures? I would be ecstatic if it was good enough. But the reality is we’re replacing coal with another fossil fuel which emits at least half as much CO2. And according to IPCC we don’t need to reduce CO2 emissions - we need to stop them by 2100, or risk a >2ºC increase in global temperature, a multi-meter increase in sea level, and the extinction of one-sixth of the Earth’s extant species. I’m disappointed that some view closing coal plants as progress, when replacing them with gas might, at best, delay 100,000-year climate changes by 100 years. That’s not only not good enough - it’s not even close.